What would i expect by doing this and can I run my stock bedsides. I'm trying to keep everything stealthy ,stock, sleeper!!! I'm on the same boat as you guys. I want to see how this goes, I'm still saving up a little more. Mark, what are you running or the rear now, if you don't mind me asking? uhh what else you spring under guys got anything else to add. I highly recommend DMZ, alot of us have gone to him for work and there no special reason why....its just cause he provides exceptional work and great customer service (its not a secret)...straight up, the dude's a nice guy and wont give you the runaround...just call him and see what im talking bout. Won't the leafs be too tall? there is a handful of guys on here that will tell you to do it no matter what. DMZ's kit is bitchin' works great and nobody has had any complaints about it. Race proven also. Anybody care to share their OTD price installed @ DMZ?! Not since he already has coilovers and spindles. If anything, it will be a little low. Stock . . . . for now. 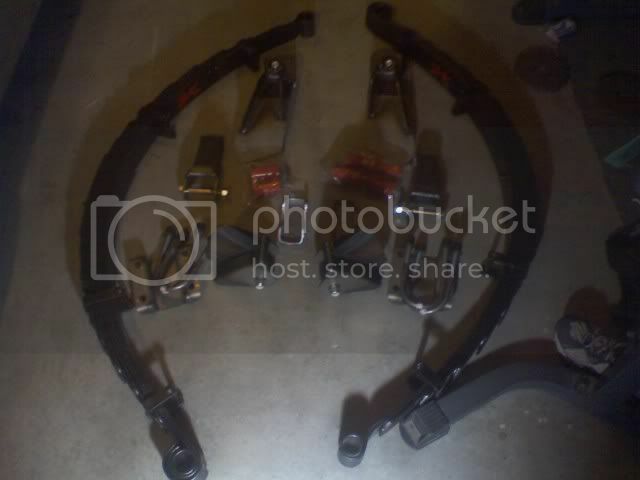 So I talked to tim today and he said that brake lines wont be needed for his kit. I didnt get a detailed list of what else was really needed for his spring under kit but i'll get one next week when i go up to his shop and "browse around" . But for the mean time anybody have anything to add to my list for the little random parts for going spring under. why dont you just get the whole DMZ kit.. It comes with Ubolts, Spring perches, etc.. to make it work?? OLD TRUCK: 2005 Toyota Tacoma DC LB v6 4x4 TRD. I agree thats what I plan on doing, quality will be more consistent-less headaches!! thats what i planned on doing but from what i saw on the site the kit looks like it only comes with the springs, front hangers,shackles,bushings and hardware. Didnt know it came with ubolts and the perches. If it does sweet means i'll have it on the truck faster! What about with out spindles? You could look at what Tim did for me a couple months ago. Now, I did add some wheelspacers to the rear so that my tires wouldn't contact my bumps at full droop/angle so the glass bedsides were needed but you can see how tight my cage is. Also kept the tailgate and the vast majority of the bed as possible. If your geometery is off, you could lose your E-brake as well so that's part of the reason to take it to a good shop like DMZ or Richer Racing that should be able to keep it. Replacing your LSPV with a manual one is also a good idea at this point too. Keeps the braking nice and level now. just went and picked up the kit yesterday. I just need to pickup some limit straps,bypasses,and some shock tabs and i'll be able to get this thing slapped on my truck soo stoked! Congrats man, were planning more trips out to oco wells soon so you have to join us! most definately will be making it out i cant wait. first guy on here that builds his truck the right way! rear first, its gonna leave up front lt guys in the dust. i know u dont have to work on ur driveshaft bec your 4wheel, but whats the cost for us pre runner guys to do that mod? Oh is that what it looks like when it's not on the truck? Nice purchase! i just need to shorten my drive shaft about 2 inches. but you prerunner guys need to add a slip joint sounds kinda pricy.